Zamora Homemade is all about enjoying homemade food. They use natural ingredients in traditional recipes and add a modern twist. Zamora shows its strongest side is character and commitment to the present, without ever losing sight of its traditions. 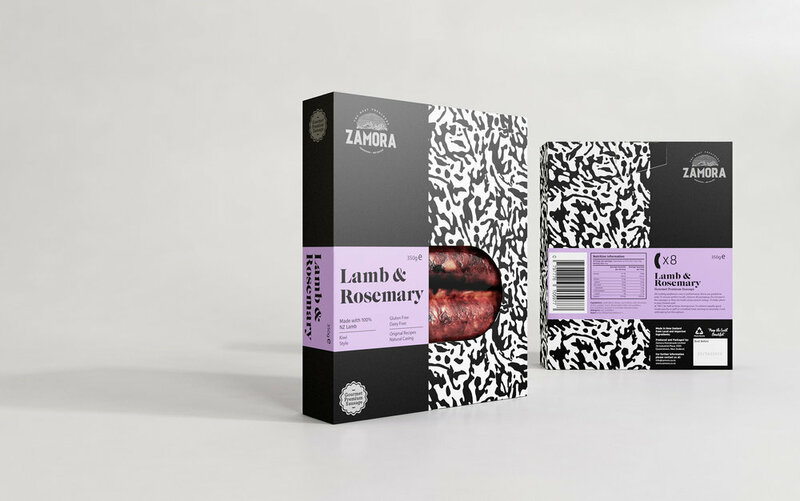 Zamora, is a boutique butchery based in Queenstown. Their love for delicious food and quality ingredients led them to make small batches of premium meat products. 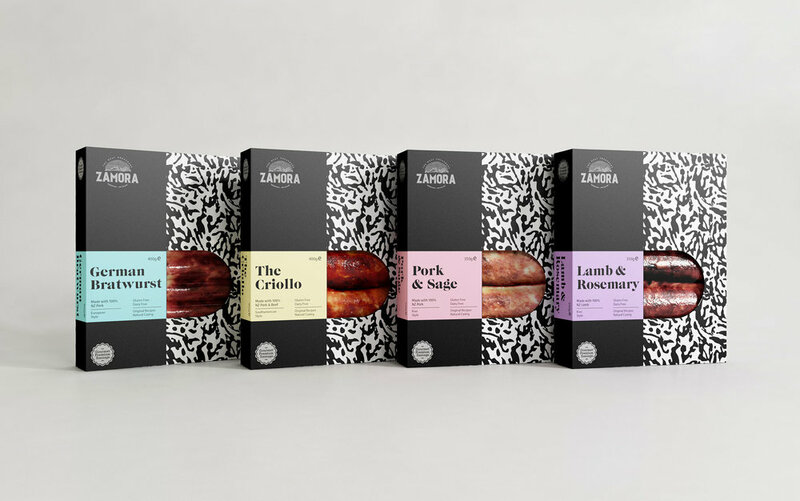 We worked with Zamora throughout 2017 and 2018 to develop a new pack range for their gourmet sausages. The challenge for this product was to target the most discerning meat lover who is constantly wishing to discover unique flavours and is willing to pay for that experience. 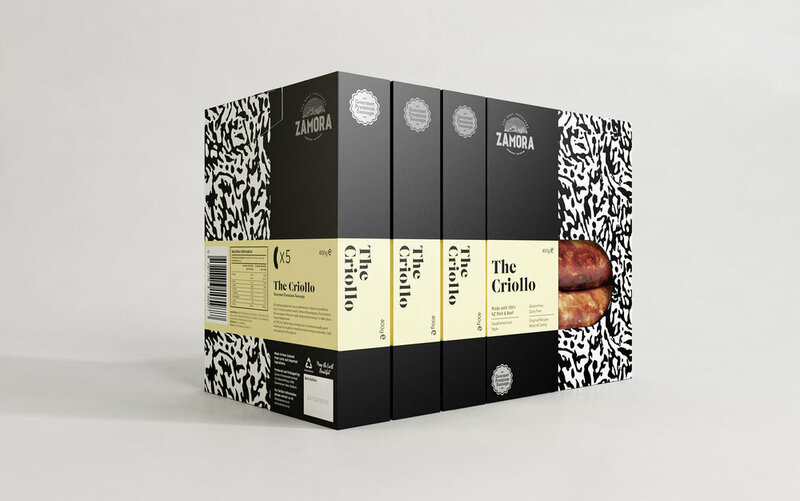 exceptional recipes, we've replaced the typical sausage tray packs with a sleek box that reflects and highlight the product's quality. The strategy of 'a different consumer experience' turns the sausage into an object of desire impossible to resist. To achieve that strategy, the design approach was centred around a uniqueness and boldness of graphic execution. There is an elegance and visual drama surrounding the sausage collection that fits perfectly with Zamora’s brand values. We worked with a unified grid system at the front of each box that clearly indicates the key attributes across the name, flavour and origin. This is paired with a pastel colour palette combined with a custom black and white pattern. This pattern it's a central part of the Zamora identity. It was created from the countryside illustration of the master logomark and it is consistently employed across Zamora products as a distinctive graphic element of the brand identity. The outcome was a friendly sophistication that makes Zamora stand out in a very competitive sector.